A Makeup & Beauty Blog – Lipglossiping » Blog Archive Double Denim, it's only ok when it's on your nails! Double Denim, it’s only ok when it’s on your nails! These Denim polishes have been out in Asda for a little while now, released just before the Summer started but I’m only getting around to them now. I don’t know about you but I think they have more of an Autumnal feel to them? First up is the blue*, which was opaque in a single coat. How much do we like it when that happens ladies? And even more than that… it dried within five-minutes, completely. Not just touch-dry you understand… but proper pull-your-knickers-up-after-a-wee dry. Amazing. The second shade, which I believe has only recently made it onto the shelves at Asda is of the black jean* variety. This one took two-coats and dries to a charcoal shade. Both polishes, as you can see, also dry to a matte finish… I could imagine that for the artistically inclined amongst you, these would make a rather cute base for adding arty things such as studs and painted stitches. Me, well…. I’m just not that creative. Wear is about average for a matte polish, a little quicker along the tips than regular polish. Removal is a little slower too with these because of the silver shimmer, which isn’t chunky… but behaves like glitter during the removal process. As I was packing my camera away, I remembered that I had an untried polish in my collection that I thought might be a dupe. 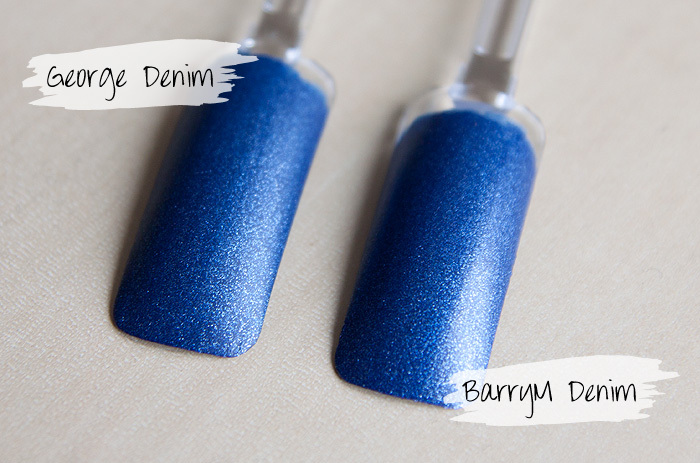 Yes, I know that BarryM’s Denim was released LAST year and it’s still in my untried box… but it is still available, and should you miss out on the Limited Edition George version, you have an alternative! As you can see, they’re pretty much identical to look at… the only difference being that the BarryM one was a little slower to dry. Do you like Denim nails? Matte seems to be the only recent (as in the last couple of years) trend that I haven’t completely tired of! George (at Asda) Denim Effect Nails are priced at £3.00 each and are available to buy instore. I actually really like these! It’s cute! “pull your knickers up after a wee dry”!! I laughed out loud. Why do I always need a wee when my nails are wet? Same reason I want to sneeze before my mascara is dry, I guess. Excellent review, if only for the sheer honesty and value of that statement. I want both the nail polishes now. And a wee. “pull-your-knickers-up-after-a-wee-dry” made me HOWL. I always, ALWAYS manage to screw up my manicure doing that. This is why you’re my favourite blogger, Charlotte. Real problems, real lives.